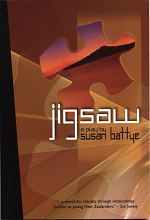 Jigsaw is a drama text suitable for classroom study by secondary school students, centring itself around our search for identity. Author and educator Susan Battye uses key topics such as body image, adoption, animal rights and the 1981 Springbok rugby tour to tell an endearing story of four young women, and their developing relationships with parents and each other. With Rangitoto Island rumbling ominously in the background, Jigsaw uses comedy, satire and the language of contemporary New Zealand to reflect on various dilemmas that will engage young adults. Performance rights are obtainable from Playmarket.